As proud as I am about the AmpliFi router, I believe the MeshPoint is the star of the platform. 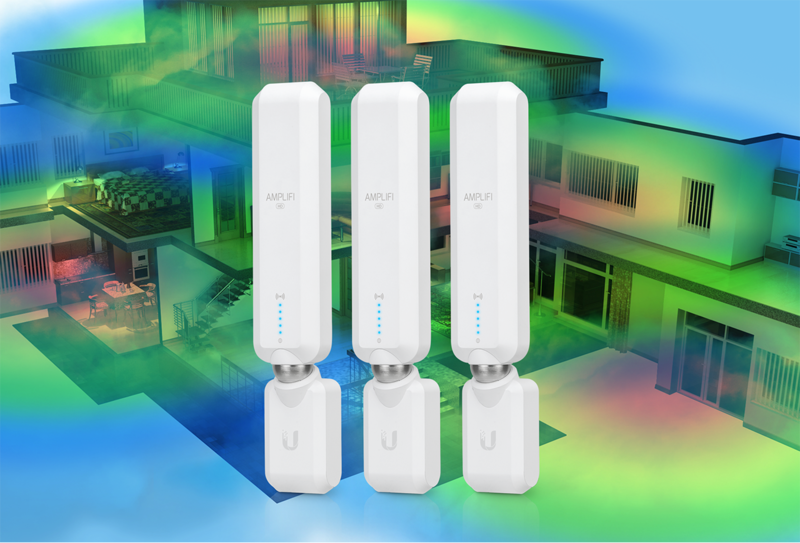 The design represents the ultimate example of form meeting function, powering complete ubiquitous Wi-Fi coverage in any home, including multi-story homes. 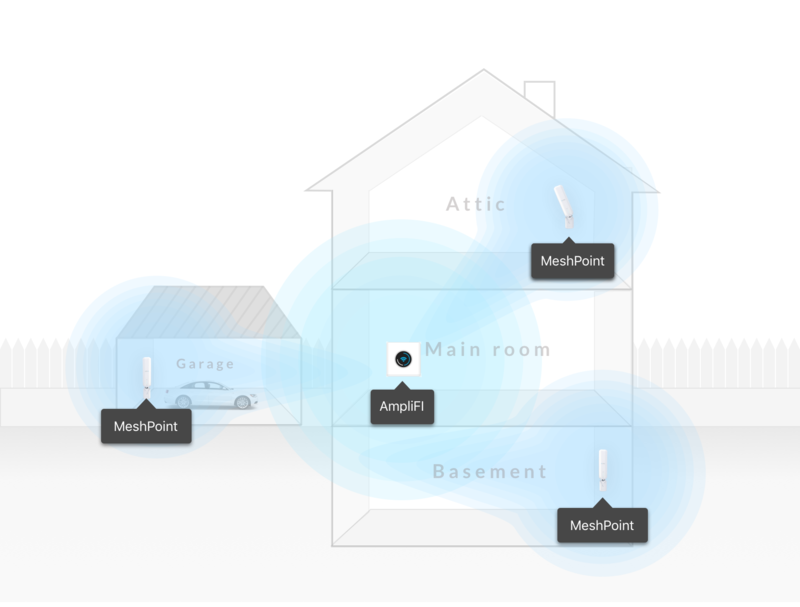 In other words, MeshPoints were designed to expand coverage in the horizontal plane (one floor) and in the vertical plane (across multiple floors) — achieving three-dimensional or “3-D Mesh” home Wi-Fi coverage. The general rule of antenna performance follows something like this: the larger the surface area of the antenna, the more signal can be sent and received (which is why the antennas that send/receive signal into deep space are monstrously large). And this is precisely why traditional routers have “ugly” external antennas — they are able to extend range more effectively with these big antennas. This is also why larger devices such as laptops and PCs generally have better Wi-Fi range performance than smaller devices such as smartphones. The larger devices have more room for larger antennas. For a mesh system, antenna performance (and antenna size) is critical. Why? Because intuitively, consumers will place mesh access points (“APs”) in areas where they currently do not have good Wi-Fi coverage. 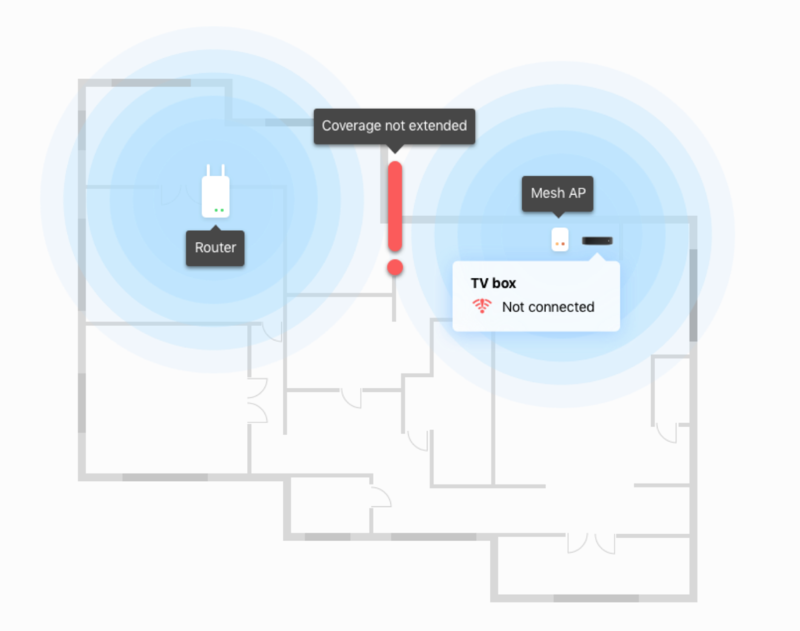 But if their existing Wi-Fi devices cannot connect back to their main router, how will a secondary mesh AP (with a similarly weak antenna) do any better? 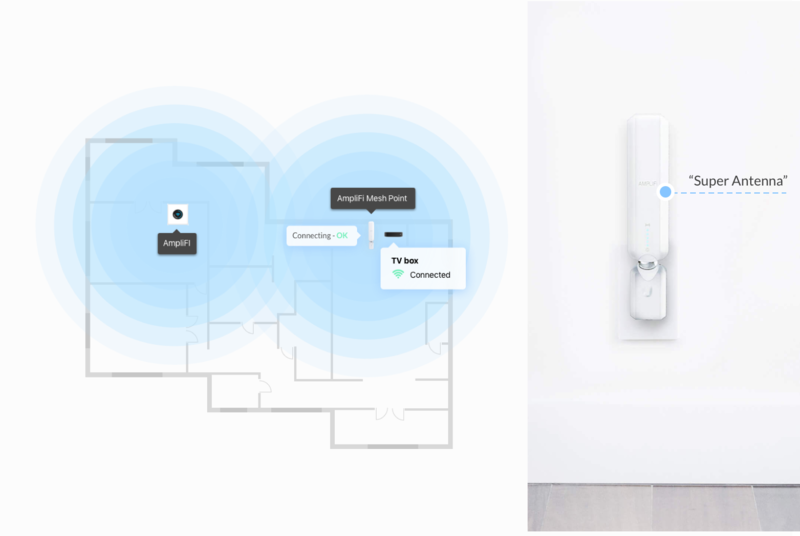 The recommended “compromise” by many manufacturers is to place the secondary mesh AP somewhere between the main router and the dead-spot area. This allows the mesh AP to have a strong link to the main router yet still extend the overall Wi-Fi network signal. But this leads to another problem — these “middle” areas tend to be in hallways instead of rooms. And who wants to have a box and AC power cable lying on a hallway floor? 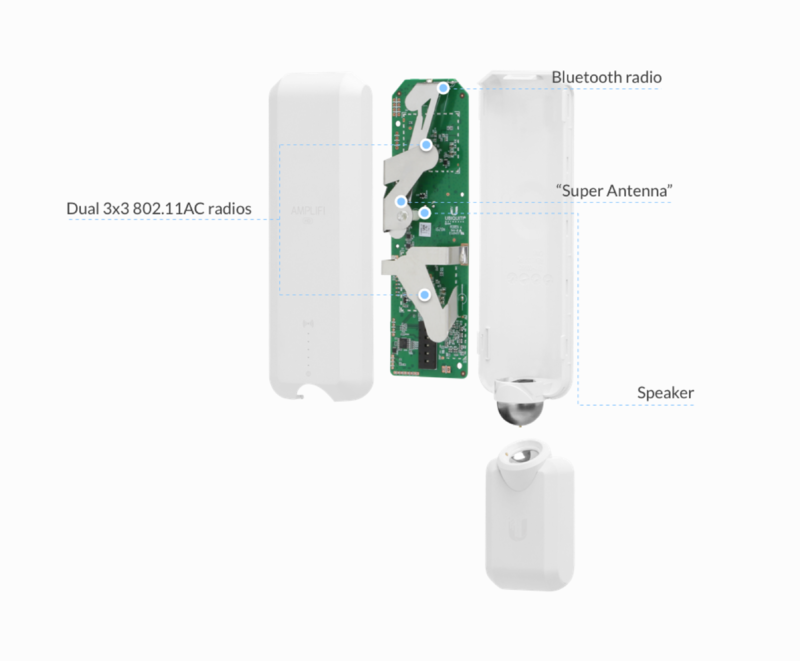 The AmpliFi MeshPoint solves each of these problems by cleverly disguising a “super antenna” inside a very powerful hardware system, enabling it to achieve a much stronger link to the main router compared to common Wi-Fi devices. 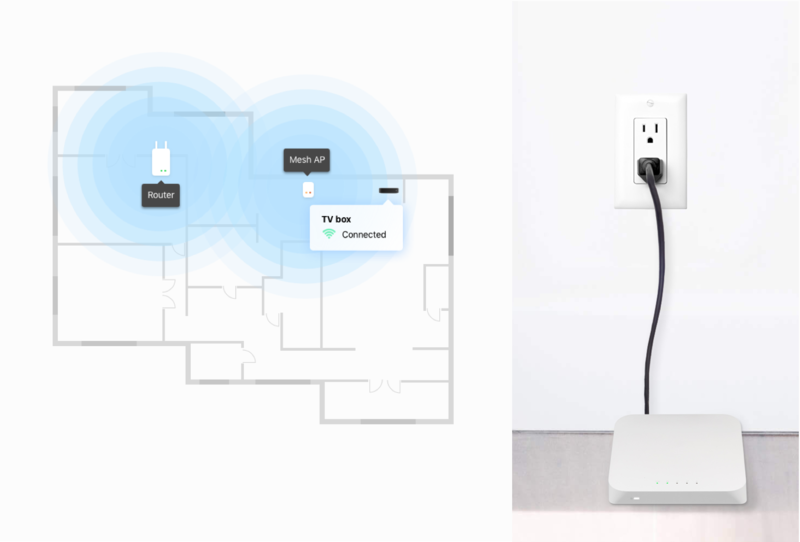 This allows users to practically install the MeshPoint directly inside the dead-zone area and solve Wi-Fi connectivity issues. Best of all, the MeshPoint can be plugged directly into any outlet without a clumsy AC power cable. In addition, if the consumer wants to locate MeshPoints closer to the router to improve performance, this application is also cleverly covered by the same design. Because the MeshPoint has a very small footprint, it is able to sit flush against the wall in virtually any wall AC socket. And with the average home having 70 AC outlets, that represents a lot of placement freedom! To say the MeshPoint antenna is “disguised” in a powerful hardware host cannot be understated. In fact, the MeshPoint packs dual 3×3 MIMO 802.11ac radios running at both 2.4 GHz and 5 GHz bands simultaneously along with a Bluetooth LE radio and an audio speaker. Having 3×3 MIMO Wi-Fi performance not only gives further range advantage, but a 50% maximum throughput boost as well. This greatly benefits mesh network performance and provides faster speeds when linking to high-end PCs and notebooks that also utilize 3×3 802.11ac technology — something not realizable with the general 2×2 MIMO Mesh Wi-Fi solutions (and unfortunately the majority of reviewers have not taken this advantage into account). The super antenna and 3×3 MIMO technology power the MeshPoint’s superior range performance. However, in order to fully realize the goal of “3-D Mesh” Wi-Fi coverage, we need a way to aggressively extend Wi-Fi coverage not just in the horizontal plane, but also in the vertical plane. Nearly all Wi-Fi solutions in the market today have antennas that send and receive signal in the horizontal plane only with very little signal extending in the vertical directions. 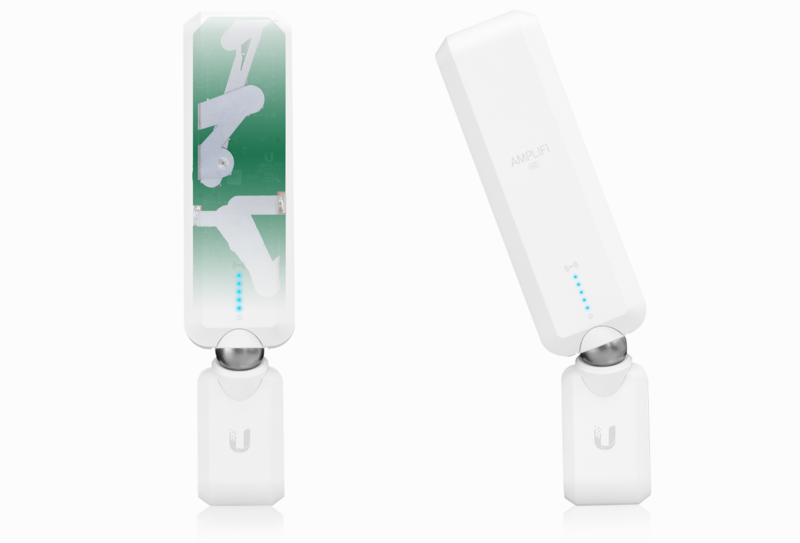 The MeshPoint’s “super antenna” has omni energy coverage, but it also has a directive antenna beam that can be used for longer-range connectivity when aligned in a specific direction. The challenge we had was finding a method to give full rotational and tilt movement to this directional antenna beam while maintaining a compact product size and keeping the installed device relatively flush against a wall. The solution we came up with is quite elegant — essentially dividing the product into 2 segments connected together by a magnetic joint. This key design feature allows the MeshPoint antenna directional freedom while plugged into an outlet and at the same time provides basic communications and power between the base and the main hardware unit. Now, we have a way to aggressively pull signal from a multi-story home and even into a deep basement or a high attic. If needed, there are also “signal strength” indicators on the MeshPoints as well as audio speaker assistance to optimize installation and performance.